Janie Chandler and Joseph Micketti have lived and practiced therapeutic massage in Southern Oregon since 1989. They have been long-time instructors at the Ashland Institute of Massage, and are co-owners of their private practice, Advanced Myotherapy. The duo’s work and good deeds have (literally) touched the lives of thousands of people. Joseph alone estimates that he has worked with over 300 hundred students, now many of them local practitioners themselves; and both Janie and Joseph have logged in over 10,000 hours of massage. Janie holds additional training in energy medicine and is an Advanced Eden Energy Medicine Practitioner and a senior faculty member of Donna Eden’s energy medicine training programs. Quite simply, their level of hands-on experience and training has allowed Janie and Joseph to attain a level of mastery that can only come with time and commitment. Meanwhile, they have also been busy raising two fabulous daughters – Autumn and Azalea – all the while keeping the passion for their profession alive and thriving. 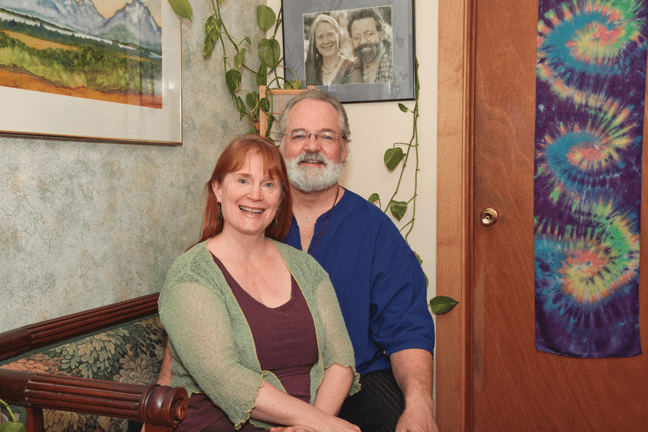 Together, they have largely contributed to the shape and form of what has grown into Ashland’s vibrant alternative healing community. When I asked what the secret behind their success has been they both replied that they thoroughly love what they do and that they are deeply gratified when they are able to help other people become pain-free and live their lives more fully. They both thrive with ongoing study and training which continues to expand their skills as health-care practitioners. Joseph spoke about his passion for organics and permaculture and how it has broadened his perspective on ecosystems and co-creative relationships, which has helped him deepen his understanding of the body and its processes. Janie says her studies in consciousness, meditation, and energy medicine show up in her deep-tissue therapeutic massage as a very holistic perspective on what it means to live in a body. I visited the home office of Advanced Myotherapy to speak with Janie and Joseph. Janie & Joseph, thanks for inviting me over and taking the time to speak with me today. Will you please begin by sharing a little of your personal history together and how you came to meet one another? It’s always felt to me that there was a grand scheme afoot which brought us together; Joseph was already a massage student living in Boulder, Colorado when I moved there to go to massage school myself. I was looking for housing with other massage students and found a perfect situation in a coed household. Turns out I fell in love with my handsome roommate, so we’ve been living and working together since the day we met. That was 28 years ago. Janie, can you take us back to tell us about some of the original training that you and Joseph both received? We are both so pleased with our initial massage education. The Boulder College of Massage Therapy was a 1,000 hour program at the time we were there, which is a pretty extensive training. We studied Swedish, Shiatsu, and Integrative Massage along with academics, nutrition, hydrotherapy and training in counseling skills. There were also a number of elective classes that we took like Sports Massage and herbology. We also had to log in a bunch of hours at the school’s public massage clinic, so by the time we graduated we felt pretty confident in our skills. Joseph, will you tell us about the unique apprenticeship you found yourself in? Shortly after Janie graduated (I’d been working at a spa for several months already) we were both hired at a pain clinic in Colorado Springs. We worked there as part of a team with osteopaths, physical therapists, acupuncturists, and psychotherapists, helping people deal with acute and chronic pain. We were seeing about 25-30 clients per week which is A LOT of massage work – mind you we were a lot younger! It was also at this time that we began studying Neuromuscular Therapy with Paul St. John – our employer at the clinic required it of us and we were perfectly happy to continue with our education. It was such a gift that we were led in this direction because that foundation in therapeutic treatment of soft tissue and the science behind it, has informed our practice over the last 27 years. I actually began my teaching career as a teaching assistant with the St. John trainings. So that intensive two-year period is what we consider to be our apprenticeship. What was the alternative practitioner landscape like when you first arrived in Ashland? When we arrived here in Southern Oregon in 1989, massage therapists were only required to have about 150 hours of training to be licensed (it’s 500 now). However, as out-of-staters we still had to jump through some hoops to have our (by that time) 2,000 hours of training approved for licensure which was kind of frustrating. There were already a number of practitioners here setting the field of Ashland’s alternative-health scene – Donna Eden, Jack Schwarz, Shari Sunshine, and the Ashland School of Massage was in its infancy – but there wasn’t nearly the high ratio of practitioners-to-community members that there is now. After settling in Ashland you both participated as some of the original faculty at the Ashland Massage Institute. Joseph, will you please talk a little bit about this experience and the students you have met over the years? In 1994 Paul St. John came through Ashland and Beth Hoffman, the director of the massage school at that time, asked him about getting his kind of work into the program. He suggested that she contact me, which she did. I had become certified in NMT a few years earlier, but I hadn’t taught on my own yet, so I roped Janie into joining me. We make a good team because I’ve got the science and technique down and she brings the art and spirit into the mix. Teaching has been both challenging and deeply gratifying for me. As I’ve worked with students over the years, I’ve seen how tricky it can be to assimilate all the new information they’ve been gathering into a confident, competent, hands-on session. It’s given me the opportunity to get super specific and in-depth with each of the neuromuscular techniques that I teach, in order to convey them to these up-and-coming practitioners in a way that they can grok and apply them as quickly and as easily as possible. Some of those students go on to become experts at working with people, muscles and pain, and others find that the profession just isn’t for them. Joseph, how would you describe your current level of mastery and how it is different than you originally expected? I wouldn’t necessarily call myself a master, but I think that’s because I am always aware of how much more there is to know about the body and its mysteries. I am always wanting to learn more, even after 28 years of studying and doing this work. That said, at this point it does feel like I have an innate sense of what’s going on in a person’s body and musculature as I observe and palpate the tissues. My hands just know what to do. The way that my work is different than I originally expected is that my initial interest in bodywork was in the Asian forms of massage – I loved studying Shiatsu in school – but when we were required to take the NMT training during that apprenticeship I had my “eureka” moment and have never looked back. Janie, you work has gone through it’s own evolution. How would you describe this experience for you? What career highlights have been most notable for you? When I first approached this career I had no idea what direction it would take – I knew that I loved being with people and that I wanted to be a beneficial presence, but I wasn’t quite sure how that was going to look. I am so grateful for the unseen guidance that first led me to the Boulder College of Massage and then into our apprenticeship, both of which helped me get really grounded in the science and therapeutic techniques that would be the foundation of my work. From that platform I was able to take off into the realms of energy medicine and begin to address the subtle energies at play in the physical experience. I LOVE working with energy and empowering people to engage their own energies to improve their health. I am also deeply grateful that I’ve had the chance to study so closely with Donna Eden, Sandy Wand and Debra Burchard, and have the honor of being a founding faculty member of the Eden Energy Medicine Certification Program. Teaching energy medicine and creating a series of educational DVDs has to be one of the biggest highlights of my career (so far). Joseph, what are some of the best compliments you have received for particularly challenging work you have done? I had a phone call this week from a woman who had been seeing me some years back for an acute issue and she said that I hadn’t seen her recently because the work we’d done together was so helpful she hadn’t needed to come back again. The reason she was calling was because a friend was in trouble and she’d told the friend that I could help. She actually drove her friend to the office and paid for the session. That really made me feel like she had confidence in me! Joseph, In specific what are your top five conditions you currently treat? Low back pain, sciatica, hip and groin pain, whiplash, thoracic outlet and carpal tunnel syndrome. Janie, you mentioned to me that you love working on people’s necks. Tell us about this and any other areas of the body you are especially versed in? One of the most incredible techniques that Joseph and I learned when we were studying with Paul St. John is working on the anterior portion of the neck. People don’t always think about how they have muscles on the front of their neck, but indeed we do. Oftentimes people with whiplash end up having the muscles at the back of the neck worked while the anterior muscles are neglected. It’s very specialized work and I love going where few massage therapists dare to go (or have been trained to go). The other technique I get a thrill from is the interior mouth work we do on people who have TMJ issues. It’s amazing how the super-strong, and often super-tight, muscles of the jaw are able to release when they are addressed from the inside of the mouth. People are often shocked at how quickly they feel relief from these techniques. Janie, what are your top five conditions you work with? Neck and jaw pain, foggy brain, overall stress and tension, anxiety and depression. Oops – that’s kinda six. Janie, what do your clients love most about your work? I think they like the spectrum that I work along; from deep tissue, therapeutic fix-it-up work to the energy balancing work, like clearing chakras or addressing meridians. I specialize in the middle of that spectrum by working a system Donna Eden calls the Radiant Circuits (also known as Strange Flows or Extraordinary Meridians) via the fascia. Fascia is an amazing conduit for our subtle energies, not to mention being a key factor in physical tension and dysfunction. Joseph, can you highlight any unique services that either yourself or Janie are best suited to address? The techniques that I use are particularly good for people who have structural issues like a rotated pelvis or a torqued sacrum, or chronic pain resulting from an accident or injury of some sort. Along with Neuromuscular Therapy, I use Trigger Point Therapy and Muscle Energy Technique to address the soft tissue and it’s relationship to joints. Janie is great at working with stress-related issues; her bag of tricks takes into account the whole body-mind-energy package. Jointly you describe your practice as promoting vibrant well being through touch, education, and loving presence. Can you say more about the loving presence part of your mission statement? We’ve been told that we have a very grounded and authentic way of being with people. One thing that we endeavor to practice both in our work and in our personal lives is non-judgement, and that shows up in the way we meet our clients where they’re at. It seems that the combination of our science-based training and heart-centered living translates into loving presence with skills to offer. As you begin to celebrate your 25th year in business together what opportunities would you like to extend to the community interested in learning more about your services? We will be at the next Wellness Faire so folks could come there to meet us and get a sampling of our work, or they could visit our websiteAdvancedMyotherapy.com, or Janie’s website EnergyMedicineNow.com. If someone is wondering if we can help them with their issue, we welcome them to call the office and talk to us about solutions we might be able to offer. If they mention that they heard about us in the Locals Guide they can get $10 off their next session! Finally, would you like to share any last comments or thoughts with our readers? We’d like to send a shout-out to all of the people in the area whom we’ve worked with over the years, clients and student’s alike. We have some clients that we’ve worked with for over a decade, and some that have just passed through on their way to better health, and we have students from years back who we still see in our continuing ed classes. We deeply appreciate your trust and patronage. AND – we warmly welcome newcomers to connect with us too!